and garlic paste and fry on low heat till oil separates. Add dhania powder, cashewnut paste and stir further. Add boneless chicken, curd, salt, pepper, chilli powder and saffron. Bring to a boil, reduce heat and simmer till chicken is cooked. Whisk in cream. 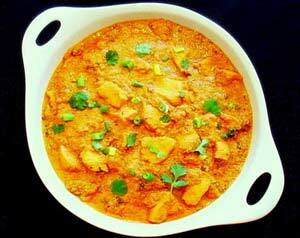 Serve kesar murg hot with tandoori rotis and parathas.